Hi we are a couple in late forties we have an 11 year old child, my husband made redundant a week before Christmas. We have never had our own business and are not really business people. We purchased our burger wagon from eBay but got ripped off, we paid £3,500 but on testing all the equipment none was working so we had to replace the lot. We spent about £2,000 on the replacement items, obtained all the necessary docs but cannot find a legal lay-by or pitch anywhere. We are at the end of our tether and at this very moment my husband is cooking burgers on a lay by that we don’t have permission to work on, what would happen to him if he got caught? We tried to do everything above board but are now virtually penniless and my husband and I are both law abiding citizens who have never so much as had a car park ticket. Can you trade in a pay and display car park after the charges cease ...9pm until 12am? I have had my catering van for 6 months but I don't know whereto find a site. I have applied to council and they said there is a waiting list.Will I ever get there? Applied for consent license with north lincs council had 1 objection to the area I want to trade from. Before buying the van I contacted the local authority and highways. We had a site meeting where I proposed to trade from they was all happy if I got all the correct licenses insurances bins register HMRC. Now I've paid for all this now there saying it's been objected on the 7th July but I didn't complete my paper work until the 17th July then they have 28 days consultation period now over and they still made me pay out all this money knowing that I was going to be objected. Can anyone please help. I have a family to support and am broke now and don't no whether to just sell the van or go buy some stock and just pull on to my pitch thanks. I have recently bought a burger van and want help with running it. What rules and legislation must I abide by if employing someone to help run it. I work part-time and need the burger van to supplement my income. Is it true if you trade on private land and have permission of the land owner then you don't need the Council's permission. This seems to be true in Gravesham as it mentions it on their website. But not sure if I venture out of my own borough as other laws may apply. I have just spent the last hour on the phone to district councils, county councils and Connect who look after the A35 trunk road, it is not so easy as it appears. Mendip District Council in Somerset stated there was no problem if I wanted to trade from a layby, West Dorset District Council passed the buck and I then phoned Dorset County Council who stated they do not allow any kind of trading in the laybys of Dorset, I explained it would in fact be the A35 so they then requested I phone Connect, the chap there was totally confused by my idea but eventually said that they will not give permission to trade on the side of the A35 but they do not throw you off either. Bottom line is the County Councils across the Country have different rules, it is not simple. After having said that this page is brilliant. I have a few Questions my sister needs help with answering. First, My sister has her own chip van this coming on two years, had it parked up because of work needing doing, after getting all work carried out, & finely getting all certificates. She now has it out for the first time since buying it, on private property & well back from the road. The thing is, 1st day having it out, environmental Health called with her, after talking with her, & knowing she was registered he left happy. Two days later street trading called saying someone reported her. After taking photos and that he left happy enough as well, 2days after that environmental health called again saying a complaint was made because of the noise of the generator. My Question is with all these complaints can any one end up putting her off the property?? And any ideas on silent generators, where to buy & what price range would they run?? Hello all,I would love to have a burger van too.It is the pitch situation that has held me back from doing it. 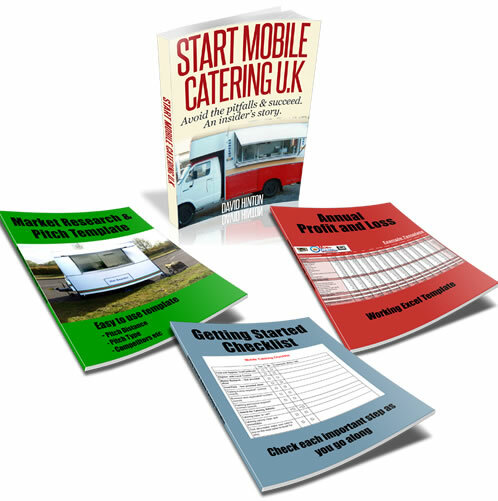 hi donnay, i have been running my mobile catering business for 2 years now. y ou do not need council permission as such to trade in any lay-by. You just need to ensure you do everything legally. What you do is you find a lay-by that you want to trade from, making sure you leave plenty of room when your hatch is open for an artic lorry to pass you. You will be moved on if you cause any obstruction. When you have found your pitch you then contact the council and they will send their health and safety officer to do a health and safety check. You must have a valid health and safety qualification. Cost of about £30. Also certs for your gas and electricity, liability insurance. Average £14 p/mnth. you will be sent certs from council for your star rating and certs for you insurance. Display these they will give your customers faith. there may be a cost for use of trading on the lay-by you choose, varies from council to council. You could pay nothing you could pay upto £500 a year. You will be given rights to trade from the health and safety officer for 2 years. once you have the rights they are yours only, no one else can trade from there, if they do you can have them moved on. You can not sell the rights to the pitch. Be wary of this, many ppl try to con others by selling them pitches that are not theirs to sell. Do not buy a pitch off an excisting trader that is on council land. You will be paying for the knowledge of where the pitch is nothing else. The thing is really, as long as you show the council and locals that you want to trade legally ie. get your insurance,certs, bin for customers use and health and safety check you will find the authorities are very easy going and helpful. There are many ignorant,filthy don't give a crap traders that ruin it for other traders. Do it right and you can make good money, get a good reputation and your customers will come back and spread the word to others. Good luck to you. Hope I'vE helped. Not sure what's this enforcement officer is talking about so can't help you much here. The best thing to do is to contact the highways agency or the council and see if they can clarify the situation for you. Why would I have to ask for plannig permission to park in lay by? Hi The enforcement officer told us to apply for planning permission if highways ok the lay by, do you know why we would have to ask for planning permission to park in a lay by? and what would be the proceedure once we have applied for planning permission please? Hi David thanks for taking the time to write back : )My husband has only been pitched on the layby for 3 days and yesterday an enforcement officer pulled up and told him he shouldnt be there blah! blah!my huband nearly had a heart attack!! but he did say if we applied to the council and highways to work the layby it could give us another 6 weeks grace until the decision is made. He is quite sure that we wont be allowed to trade there after the answer comes back. I have tried all the suggestions you made except branching out with a party package as unfortunately money is very tight. We feel so jelous of the people we see on laybys and events, we dont want to be rich only make a living, the alternative would be to claim benefits. My husbad is unemployable because of ill health. I have a part time job and cant get anymore work because of my age, goodness me i have tried! Try These Ideas And Don't Give Up! I have to empathize with you. Firstly I have been in the same predicament as yourself and fully understand your situation. I will suggest a couple of things to try and help you, and hopefully other people with also contribute. This may not be a bad thing – because if someone approached you. As it gives you the opportunity to find out who actually owns the land, and if they can give you permission to trade legally. It may be one week, a month or even a year before someone is bothered to approach you. In the meantime you should still look for a pitch to trade legally on as this will be a better and long-term solution. Also you can try www.retailconcessions.co.uk and see if they have any pitches that you can trade on. They won’t be cheap but you may be lucky and find a really good pitch with them. They supply/manage the mobile catering service for all the B&Q, Homebase etc pitches. The eventsbook.co.uk also has a list of events around the country that you may be able to attend. Give it a shot and see what you come out with. Don’t forget to try pubs and clubs in the evening and see if you can park up and sell. Football matches that may be local to you Sat-Sun and any up and coming fetes, fairs or car boot sales. What about mobile catering for parties and children’s parties, rent bouncy castle and offer a complete service. Get creative and look around you, offer something different and unique and better than other businesses not offering. Get some leaflets made up, advertise in your local paper and see what turns up for you. I hope that I have given you some ideas, the main thing is not to worry and move forward with your business. Best of luck with our new business, please keep us updated and don’t give up!